Trump is focused on doing "the people's business," according to Lewandowski. Staff members in Donald Trump's White House should be "fully supporting the president's agenda" and should be fired for speaking to the press without authorization, according to Trump's former campaign manager Corey Lewandowski. "Any person who serves in this administration — whether it's in the White House or in some other department — that isn't fully supporting the president's agenda should not be there. It's very simple," he said today on "Good Morning America." Lewandowski's comments come amid reports of increased tension among White House staffers after the appointment of a special counsel to lead the investigation into Russian interference in the 2016 presidential election. "And if you don't think that the president's agenda is the right agenda, then you have the prerogative as a staff member to leave at your earliest convenience," he said. "And you should be fired, candidly, if you're speaking to the press outside of the course of the individuals who are authorized to speak to the press." Trump has reportedly been turning to old campaign advisers as his White House deals with the fallout from his decision to fire FBI Director James Comey last week. The existence of a memo Comey reportedly wrote after a February meeting with Trump at the White House came to light this week. The memo reportedly said Trump asked him to drop the investigation into his former national security adviser Michael Flynn's dealings with Russia. Lewandowski, who was fired as Trump's campaign manager in June 2016, visited the White House this week but denied that he will formally join the Trump administration. "Only as a visitor," Lewandowski said when asked if he will go into the White House. (Charlie Neibergall/AP Photo) Republican presidential candidate Donald Trump, right, walks with his campaign manager Corey Lewandowski after speaking at a news conference in Dubuque, Iowa, Aug. 25, 2015. Asked whether Trump understood the backlash his administration would face with Comey's firing, Lewandowski said, "The president has the privilege of firing James Comey. James Comey has said that. And he decided that James Comey was no longer up for the task of being the director of the FBI. There's nothing wrong with that." Deputy Attorney General Rod Rosenstein on Wednesday announced that he assigned former FBI Director Robert Mueller to "oversee the previously confirmed FBI investigation of Russian government efforts to influence the 2016 presidential election and related matters." As special counsel, Mueller is expected to have the ability to take matters before a grand jury, issue subpoenas and assign federal agents to the investigation. The White House had "absolutely no indication" the appointment was coming, a senior White House official told ABC News. White House counsel Don McGahn personally delivered the news to Trump after receiving a call from Rosenstein. Attorney General Jeff Sessions, who previously recused himself from issues pertaining to the election, was at the White House at the time, but it is unclear if he had any interaction with Trump. A group of senior advisers — including Vice President Mike Pence, chief of staff Reince Priebus, press secretary Sean Spicer, counselor to the president Kellyanne Conway, director of strategic communications Hope Hicks and director of social media Dan Scavino — convened with Trump at the White House to formulate a response after McGahn shared the development. The White House released a statement from the president over two hours later. "As I have stated many times, a thorough investigation will confirm what we already know — there was no collusion between my campaign and any foreign entity," the statement read. "I look forward to this matter concluding quickly. In the meantime, I will never stop fighting for the people and the issues that matter most to the future of our country." Lewandowski declined to provide specifics on his interactions with Trump but described him as focused on doing "the people's business." "He has an aggressive agenda," Lewandowski added. He described himself as eager to make sure Trump's agenda "is getting done" and said that anyone without the same loyalty to him "should not be in the administration." 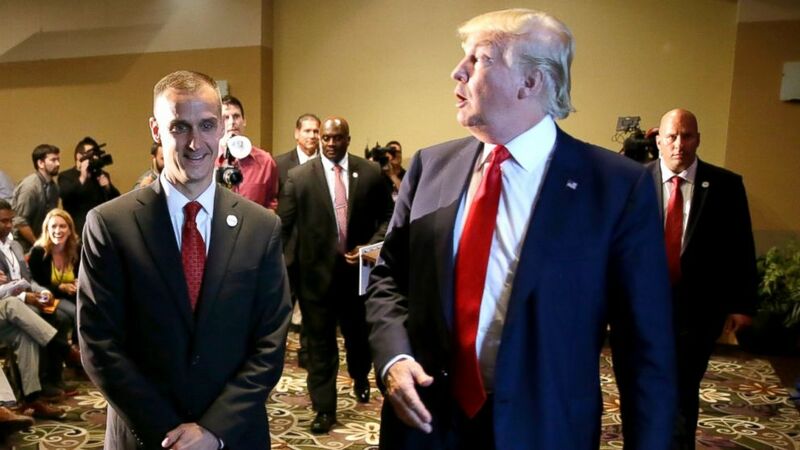 "I can tell you there are a number of people who the president is next to who are exceptionally loyal to him, and if anybody isn't loyal to him, they shouldn't be there," Lewandowski said. ABC News' Cecilia Vega, Adam Kelsey and Mike Levine contributed to this report.